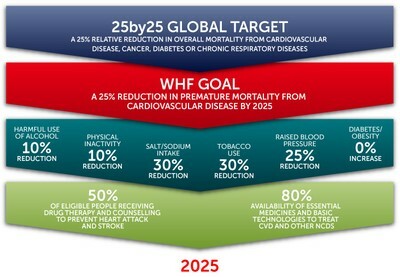 The ’25 by 25′ campaign is in line with existing World Health Organization (WHO) commitments to reduce overall mortality from the four major non-communicable diseases (NCDs) – cardiovascular disease (CVD), including heart disease and stroke), diabetes, cancers and lung diseases – by 25% by 2025. To support the broad 25by25 vision for NCDs, the WHO launched a set of targets and indicators in 2014. Achieving these targets, which are found in the Global Monitoring Framework, will have a direct impact on reducing the global burden of CVD. CVD accounts for 31% of global deaths: this amounts to 17.5 million people losing their lives every year. Over three quarters of CVD deaths take place in low- and middle-income countries, which carry heavy socio-economic burdens associated with CVD. 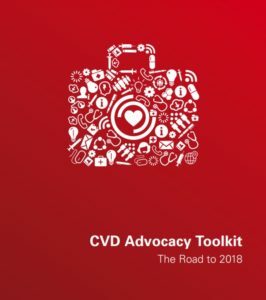 Beyond these alarming facts and figures, CVD is a devastating, yet often preventable disease, which affects people, families and communities all over the world. Therefore, to reduce the global burden of NCDs and achieve the 25by25 target, it is essential that CVD and its risk factors are addressed. In September 2015, world leaders convened at the United Nations to formally adopt the 2030 Agenda for Sustainable Development; an ambitious global framework to end extreme poverty, eliminate inequality and injustice, improve health outcomes and conserve our planet over the next fifteen years. Also known as the Sustainable Development Goals (SDGs), the 2030 Agenda succeeds the Millennium Development Goals, which ran from 2000-2015, and comprises 17 major goals supported by 169 targets. Thanks to years of extensive advocacy, health features prominently within the SDGs, as Goal 3 of the Agenda: ‘Ensure healthy lives and promote wellbeing for all at all ages’. For the first time in history, non-communicable diseases (NCDs), including cardiovascular disease (CVD), are specifically included in the Agenda as a major development priority. This means that each of the 193 country signatories of the document have committed resources, expertise and collaborative efforts to prevent and control heart disease and other NCDs. Never before have governments been so strongly compelled to act on the global CVD epidemic. While the inclusion of CVD and NCDs in Agenda 2030 is a landmark achievement, our work is far from over. Now, more than ever, governments need to be encouraged and assisted to achieve the new target of reducing NCDs by one third by 2030. 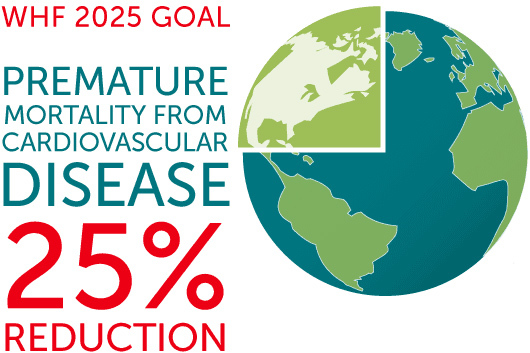 A key way to meet this goal is to continue working towards the World Heart Federation’s target of reducing CVD by 25% by 2025, as CVD continues to cause the highest proportion of non-communicable deaths across the world. At the United Nations High-level Meeting on NCDs in 2018 (HLM 2018), WHO Member States will review their progress on NCDs, both nationally and globally, and towards the 4 time-bound commitments set in 2014. Given the scale of the global NCD epidemic, progress so far has been inadequate, and urgent action is needed. It is now time to increase the pace in terms of advocacy and campaigning so that countries are compelled to act.